This may turn out to be less of a review of a book than a ‘working-through’ of one, because I’m well aware that I haven’t grasped everything that Galileo’s Dream is trying to do, and so can’t appreciate it as much as I would have liked. But I’d like to set down my thoughts all the same. It would be quite easy, I think, to describe this novel in a way that sounds like a bad movie pitch: Galileo receives visitors from the future, who take him back (forward!) to their time in an attempt to stave off a threat to humanity itself! All of this is accurate, but makes the book sound gimmicky; it’s to Robinson’s great credit that Galileo’s Dream has far more gravitas than that. Two narratives combine: one a fictionalised account of Galileo’s life and career (beginning with his work on the telescope), which is here punctuated by visits from a stranger who nudges Galileo’s researches along, and later transports him forward 1,400 years, where humanity has colonised Jupiter’s moons and is debating how best to approach an alien intelligence it has found there. Galileo, the stranger thinks, could help sway the different factions towards his preferred solution – but his motives run even deeper than that. These two settings mesh together somewhat awkwardly, partly because the future society is depicted rather more vaguely; and partly because of a clash of styles – the 31st-century sections are generally more novelistic, whilst those set in the 17th century are typically written more in the manner of a historical biography. That said, all these choices are justified – Gailieo’s visits to the future are episodic in nature (during those times, he appears in Italy to have fainted, so those visits are also dreams of a sort to him); and Galileo’s Dream is framed as a particular kind of text, which accounts for its different modes of telling – and the combination does work well enough to be convincing. Galileo’s Dream is a long, detailed novel; and some of its passages drag on too long (though it could be that I feel this because I didn’t know all that much about Galileo’s life). But there are also brilliant moments, and some of the best are also among the most dense with information. 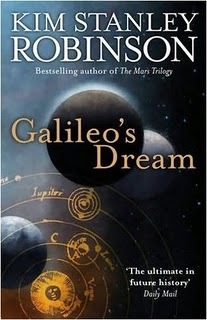 Robinson brings vividly to life the sheer amount of painstaking work that would have been involved (and that, I’m sure, still is involved) in scientific experimentation; the character traits that could go with it (Galileo is portrayed as well-meaning but difficult to get along with, and as not paying attention to the political landscape, which ultimately proves his undoing); but also the wonder of creating knowledge. Another aspect of Galileo’s Dream is that (as I read it) Robinson seeks to reflect the novel’s scientific concepts in the narrative itself. So, for example, Galileo learns that changing the past could change the future; and then, each time he visits Rome, he feels that it’s a different place each time, because the political climate keeps changing. For me, the best example of this comes after Galileo is told of the myriad possible time streams that exist and that all pasts, presents and futures are tangled together; in a beautifully written passage, he then returns to his time and wonders what’s the point of doing anything. I think this last area was where I missed out the most – I sense there’s quite a lot on which I didn’t pick up – and, since it’s so central, that naturally affects how much I took from Galileo’s Dream. I don’t think it’s an entirely successful work, but I am glad to have read it – it was my first Kim Stanley Robinson novel, and I intend to read more. I stumbled upon Torque Control which lead me to your review. I haven’t read anything by Kim Stanley Robinson but have been planning to for my Hugo challenge. Your review of Galileo’s Dream makes the book sounds very intriguing. I’ve been teaching my son about Galileo so when I come across fictionalized stories about him, I enjoy reading them. At least I’ll be armed in advance that the story is a difficult read and take my time. Thanks for the review. Hi Robin, and thanks for visiting and commenting. I would say that the real “difficulty” of Galileo’s Dream lies in trying to grasp everything that Robinson is trying to do (which I don’t think I managed fully). It’s not a hard slog in terms of the prose (when I found it to drag, it was more because there was simply so much of it). Definitely worth a read, and I’ll be interested to know what you make of it!